This Christmas my nephew, Kyle, and his wife, Kerri, gave me the Historic Ales of Scotland gift pack from Williams Bros. Brewing. The pack contains four different ales brewed using ancient recipes used in old Scotland before hops could be commercially brought into the country. Each pack contains four out of the five beers which the company brews. Mine has a Fraoch Heather Ale, a Grozet Gooseberry Ale, an Alba pine flavoured ale and an Ebulum Elderberry Ale, which I have written about before. 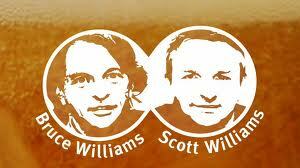 Williams Bros. started not as a brewery but as home brew shop in Glasgow. In 1988, a woman of Gaelic descent came into the store armed with a family recipe for Heather Ale, which she wanted to re-create for her family. She said she would share the recipe if they would teach her how to make the ale. After some experimenting, the recipe was created and the brothers, Bruce and Scott, decided to open a brewery in Craigmill, Strathaven. In 2004, they needed a larger brewery so they bought the Fourth Brewery in Alloa and moved in, where they have brewed ever since. Alloa was once considered the brewing centre of Scotland due to the huge supply of grain and the fact that it sat on a harbour. The harbour was important as most brewers in Alloa shipped IPA to India and the town was regarded as second in only to Burton on the Trent fro brewing in the British Isles. Today Williams Bros. is the only brewery in the city. As I have written about the Ebulum Elderberry Ale before, I will only say that I enjoyed it the first time I had it and again when I had from this pack. And lay in a blessed swound. The beer pours golden in colour with a white head which dissipates quickly. There is an earthy quality to the aroma. There is very little carbonation in this. On my first sip the beer starts a little weak and then along comes a sweetness. I don't usually enjoy a sweet beer, but I am liking this one. It's not overly sweet and has a nice finish which is impossible for me to identify, but likely is the Heather. A very nice ale! Grozet Gooseberry & Wheat Ale: I am starting to get it now. Grozet is Gaelic for gooseberry. Where above when I claimed the name is a little redundant, now I see the charm. Sometimes it takes awhile for me to catch on! This beer pours a cloudy yellow in colour, with a white head. Lot's of lacings are left behind on the glass as I sip. The aroma is lively and speaks of the gooseberry in the beer. The taste is a little complicated. It starts a little sweet and full of gooseberry, which disappears and becomes a little sour, then the gooseberry returns again for the finish. An excellent beer, especially for a hot day! Alba Scots Pine Ale: Spruce and pine ales were popular in Scotland until the end of the 19th century. In the spring, the green shoots at the tips of the evergreen trees are picked. They are much milder and less resinous than older, more mature twigs and needles. I have had a spruce beer once before, which I liked, so this should be an interesting comparison. According to the description on the bottle, this 7.5% "tripel" style beer is brewed to a traditional Highland recipe. The beer pours a coppery, reddish colour with very little head. The aroma is quite malty with a hint of caramel. There is very little carbonation in this. It is a heavier tasting beer with just a slight hint of pine or spruce and some caramel that I noted in the aroma. This is not a bad beer but one not really to my taste. All in all, a great present. I just loved three out the four beers in the pack. Thanks, Kyle! Thanks, Kerri! It was fun trying them all.